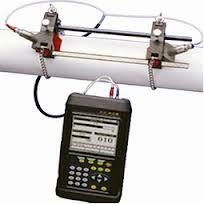 Transit Time flowmeters measure the time it takes for an ultrasonic signal transmitted from one sensor, to cross a pipe and be received by a second sensor. Upstream and downstream time measurements are compared. With no flow, the transit time would be equal in both directions. With flow, sound will travel faster in the direction of flow and slower against the flow. Because the ultrasonic signal must cross the pipe to a receiving transducer, the fluid must not contain a significant concentration of bubbles or solids. Otherwise the high frequency sound will be attenuated and too weak to traverse the pipe. Also check our Thermal Anemometer Equipment!